As US troops begin their retreat from Syria — leaving a void that will surely hurt America’s friends and directly help foes like Russia, Iran and the Assad regime — Secretary of State Mike Pompeo announced from Cairo last week that diplomacy will be hard at work to remove every last Iranian boot from Syrian soil. I am not sure where Pompeo’s certainty comes from, especially as policies by President Donald Trump and his predecessor Barack Obama have directly and indirectly helped Iran’s hand in the Middle East. Tehran’s military generals regularly boast that the country has access to the Mediterranean through its allies in Iraq, Syria and Lebanon, as well as access to the busy Red Sea maritime routes through its allies the Houthi rebels in Yemen. I wonder how Pompeo’s promises will be achievable in 2019 and beyond, since Washington failed to even boot the Iranians out of post-Saddam Hussein era Iraq, where Tehran now seems to have free hand to dictate the name of the prime minister and his ministers. Iraqis from all walks of life agree that Iran is the main power broker in the country, and those who oppose its strategic bidding are usually marginalized. Since 2003, it is no secret that Tehran, through the Quds Force and its commander Qassem Soleimani, has positioned itself as the gatekeeper of Iraq. In his speech in Cairo and the subsequent comments made in other Arab and Gulf states, Pompeo vowed that the US and its allies would work to forge a common stand against Iran, prior to announcing that a summit will be held in Poland in mid-February with the objective of curbing Tehran’s influence in the region. However, Iran is not as strong as Foreign Minister Mohammed Javad Zarif claimed in a recent tweet, as protests against government economic failures have been rising. Although the slide of the Iranian rial may have been steadied despite the renewed US sanctions regime that took effect in November, the public mood in the country has been increasingly hostile to the Islamic Republic’s foreign meddling. People resent funds being diverted away from their homes and instead allegedly put toward empowering Shiite militias in various part of the Arab world, as well as helping the Palestinians, especially Hamas, fight Israel. These causes are seen by most Iranians as counterproductive to peace, security and the economic wellbeing of their nation. 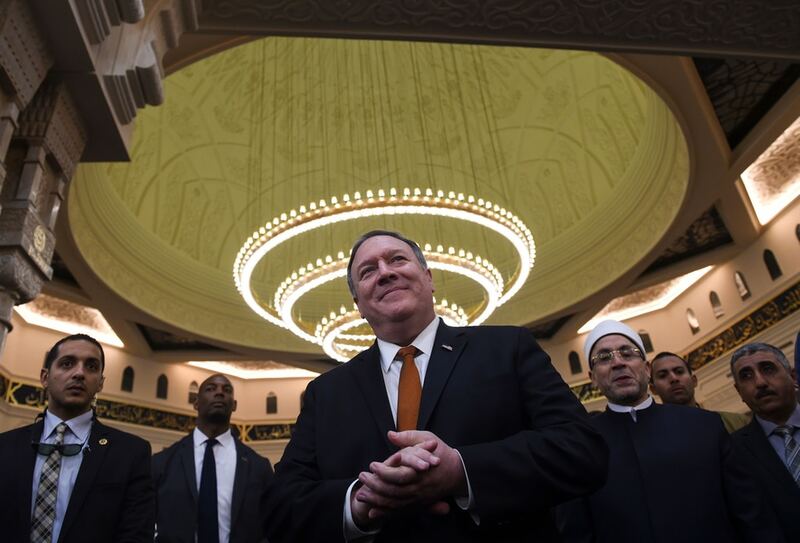 Pompeo’s tour could not have come at a worse time, as concerns have been rising, even among Arab allies, that US policies in the region have become erratic and unstable. The long-promised Trump plan for a peace deal between the Israelis and Palestinians has so far failed to materialize. Meanwhile, Washington moved its Israeli Embassy to Jerusalem despite Arab and Western concerns. Throughout the US hostage crisis, the Iran-Iraq War, the War on Terror, the US occupation of Iraq and the war on Daesh, Iran has always managed to advance its interests and those of its key allies at the expense of traditional US allies, including Israel. A brief analysis of US positions vis-a-vis major events in the Middle East in the last decade shows a clear gap between Washington’s public diplomacy stance and its executive decisions, which have had counterproductive impacts on various military, political and social issues. Its renewed efforts to contain Iran’s nuclear, ballistic missile and meddling strategies have gathered pace but, if they are to deliver in the long run, they will need US consistency and the ability to sustain pressure even when administrations change. In the 40 years since its establishment, the Iranian regime has demonstrated belligerence and defiance in the face of sanctions. Throughout the US hostage crisis, the Iran-Iraq War, the War on Terror, the US occupation of Iraq and the war on Daesh, Iran has always managed to advance its interests and those of its key allies at the expense of traditional US allies, including Israel. Even by the account of outgoing Israel Defense Forces Chief of Staff Gadi Eisenkot, the containment of Iran in Lebanon and Syria has not stopped Tehran’s ambitions despite several wars, surgical attacks and covert operations. Instead it has disrupted but not weakened Iranian assets. So the new US strategy alluded to during Pompeo’s tour of key Arab capitals begs some questions, as Tehran continues to meddle in Syria, Iraq, Afghanistan, Yemen and, of course, Lebanon.